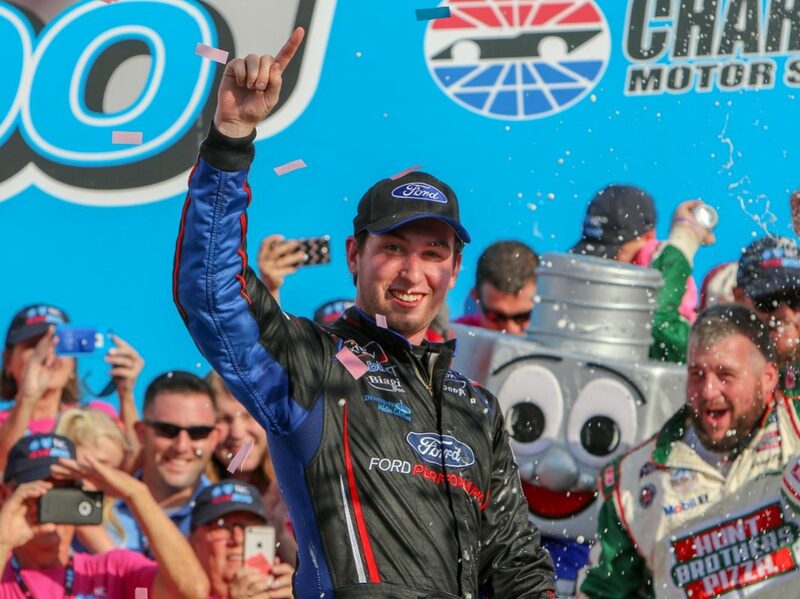 CONCORD, N.C. – Chase Briscoe validated his place as a Ford Performance development driver with a convincing victory in Saturday’s Drive for the Cure 200 at the Charlotte Motor Speedway ROVAL. Briscoe, who has driven part-time in the IMSA Continental Tire SportsCar Challenge this season in addition to select NASCAR national series starts, put together a perfect final stage to capture the win at the 17-turn, 2.28-mile circuit. He pitted just prior to the end of the second stage break, inherited the lead when the rest of the frontrunners came down for service and never looked back after that. In fact, that same strategy is exactly how Briscoe took the lead for the first time at lap 18 from opening stage winner Daniel Hemric. Briscoe pitted his No. 98 Ford with three to go in the opening stint, then led nine circuits before making his final stop of the day at halfway. All told, Briscoe led 33 of 55 laps – including the final 24 – en route to his first NASCAR Xfinity Series win. 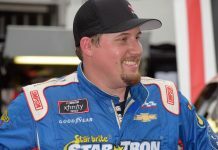 He held off spirited charges from both Hemric and Justin Marks in the final 15 laps, ultimately capturing the win by 1.478 seconds over Marks. The Mitchell, Ind., native was understandably emotional in victory lane, as his win came for Stewart-Haas Racing with Biagi-DenBeste, a team co-owned by Briscoe’s racing hero Tony Stewart. “This is unreal,” said an elated Briscoe. “I was four seconds off in practice, and my guys stuck behind me and kept working with me. It’s just an honor and privilege to drive a race car and to do it for my hero, Tony Stewart, and get a win. In a race where carnage was feared, Saturday’s proceedings only featured two cautions for on-track troubles. The first came on lap two, when Alex Labbe stalled in turn one with a broken axle, and the second came when the green flag waved to start the final stage after a multi-car pileup in turn one. 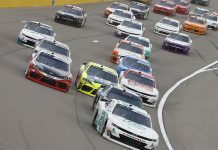 Once that incident was cleaned up, racing resumed with 19 to go and saw opening stage winner Daniel Hemric slot into second, glued to Briscoe’s back bumper after showing the most speed for most of the race weekend. A caution for debris on the backstretch from Ryan Sieg’s wounded machine with 15 laps left bunched the field one more time and gave Hemric a chance to pounce. However, Hemric wheel-hopped and missed the final chicane coming to 10 to go and had to serve a stop-and-go penalty that took him out of contention for the victory. Once Hemric faded back through the field, Briscoe was left with only Marks as a major challenger in the final laps, and though the retiring road-course ace tried to get close enough to make a move, Marks didn’t have enough in his No. 42 Chevrolet to challenge down the stretch. Despite finishing second, Marks still had high praise for the ROVAL course after climbing from his car. “I really applaud the effort everybody made to put this track together,” noted Marks. “The track itself is challenging… They did a great job of painting the infield, there’s a lot of grip there, and it’s a really challenging course. You want to challenge this group of drivers. You want it to be hard for them. Austin Cindric rallied back to finish third after spinning from the race lead in the infield section of the course at lap 14. Ryan Preece and Christopher Bell, who won the opening stage, completed the top five. 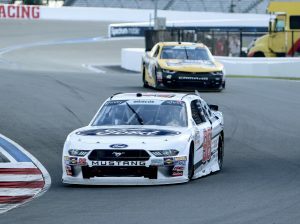 Matt Tifft crossed the line sixth, followed by Cole Custer, Kaz Grala, Tyler Reddick and Hemric, who was as far back as 15th after his misstep in the final chicane but made several passes late in the race. 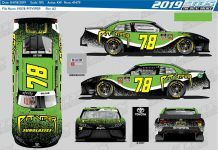 With one race to go at Dover Int’l Speedway before the lowest four drivers are cut from the playoff field, Ross Chastain holds a tenuous nine-point margin over Cindric for the final berth into the round of eight. Cindric, Ryan Truex, Ryan Reed and Brandon Jones are at risk of elimination next week in Dover. For full race results, advance to the next page.